Like much of Sze’s work, Compass Rose is anchored by numbered, serial poems driven by paratactic images and overheard snippets of language laid down in rapid succession. Sze privileges active present tense verbs (“an owl lifts,” “kiwis hang,” “he swerves,” “surf slams,” “two planets bob”) and temporal ligatures like “while” and “as” that make the actions in his poems feel coincident rather than causal. Though Sze sometimes adopts a deeply emotional lyric “I,” more often the work is peopled with characters who are typecast by occupation—“At the lab a technician prepares a response / to a hypothetical anthrax attack”; “A healer aligns / her east and west”; “A veteran’s wince coincides / with the pang a girl feels when / she masters hooked bows in a minuet”—all of which deepens the feeling that each of us is not an inviolably unique person, but rather an actor embedded in a larger web of physical life. This goes for the poet, too. Even as he mines his surroundings for sensuous lines of verse, Sze’s speaker seems consistently aware of the limits of human perception and our insignificance, to borrow a brutal phrase from Mao, “as far as the universe as a whole is concerned.” In many ways the book is governed by a desire to contend with this in language, to make palpable the elusive natural forces that structure the present: “If I sprinkle iron filings onto a sheet / of paper, I make visible / the magnetic lines of the moment.” Magnetic lines, state lines, nanoseconds, meteorological isobars, ultraviolet radiation—Sze’s wide aperture, observational precision, and sustained intellectual pressure transform what seems beyond the grasp of the human senses into events in language. 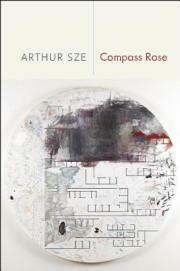 In the compass rose, Sze finds an elegant metaphor for this poetics. A compass rose is the figure on a compass or nautical map that depicts the cardinal directions: North, East, South, and West. In its crudest form it resembles a four-pointed star, but many designs bisect the cardinal directions into smaller units such as Northeast, East-Northeast, and so on. The more precise the observational units on a compass get, the more its lines proliferate, and the more the pointed star begins to resemble an ornate rose in bloom. Like a compass rose, Sze’s meticulous examinations of scientific phenomena ultimately yield aesthetic rewards, and what appears at first to be plainly aesthetic, such as “the heart-shaped leaves of spring,” is often revealed to be an illusory aspect of a more complicated system in which “dark energy and dark / matter enlace this world.” Indeed, in the title poem Sze draws a parallel between this scientific-aesthetic tension and the poetic tension between literal and figurative uses of language. “What closes and is literal, / what opens and is figurative?” he writes, only to reverse the aphoristic question a few lines later: “what closes / and is figurative, what opens and is literal?” These poems vibrate in the hidden, interstitial spaces between open and closed, literal and figurative, science and art, the land and its maps, the compass and the rose. This entry was posted in Uncategorized and tagged Fall 2014 on November 4, 2014 by Kelly.